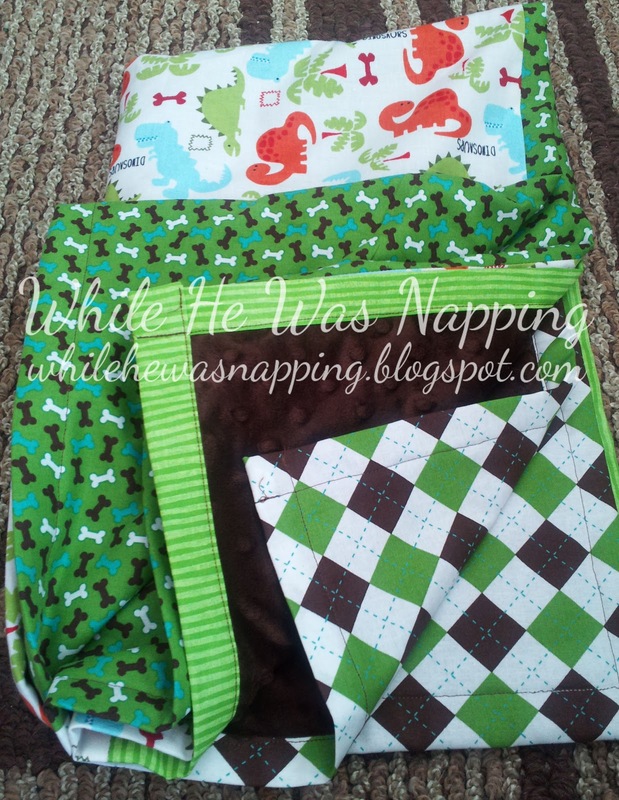 I set the goal for myself that I would make each of my children a blanket before they were born. So far, so good. 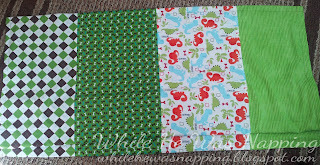 Little Monkey got this Safari Quilt and it was one of my first projects I put up on this blog. And, that translates to: the tutorial on it is less than impressive. 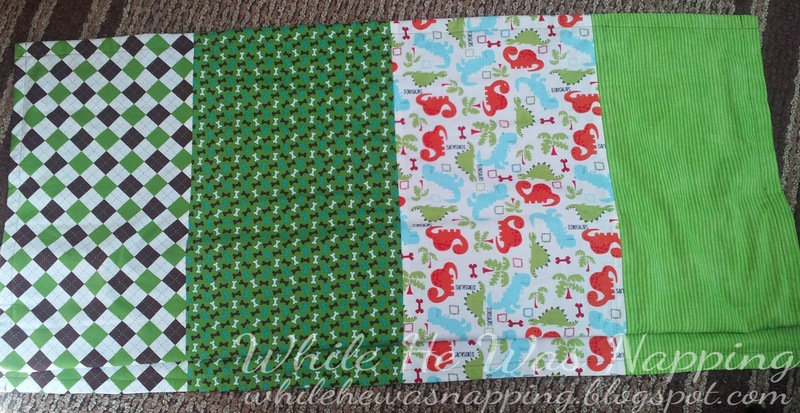 So, I used the same binding method on this new little baby’s blanket as I did on Little Monkey’s quilt and figured this was as good a time as any to re-visit that post. This blanket was my first strip quilt and, let me say, easy peasy! 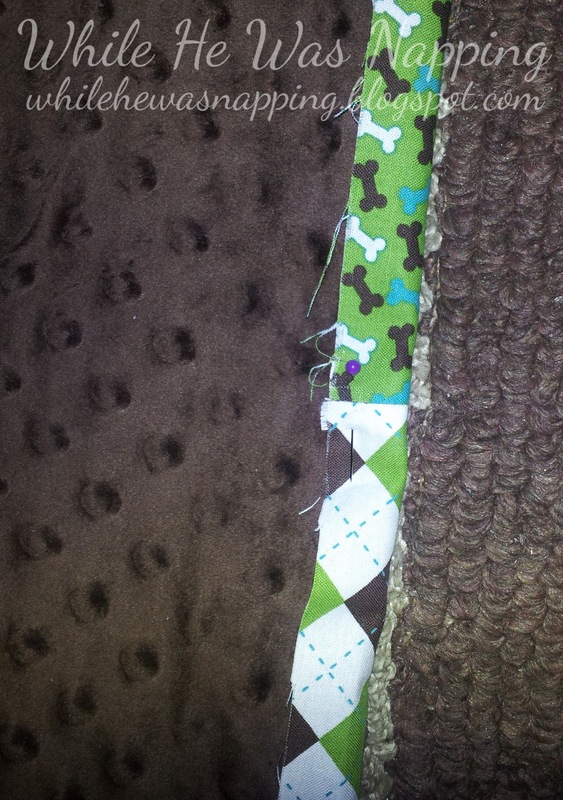 I spent more time cleaning out my sewing machine because my thread kept tangling than I did on the actual quilt ( I’d never cleaned my sewing machine before… I got the machine for my 16th birthday… probably a miracle it still worked at all.)! 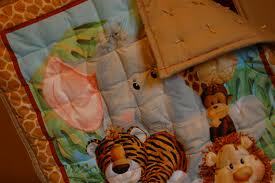 There will definitely be more of these types of quilts and blankets in my future. – Coordinating fabrics. 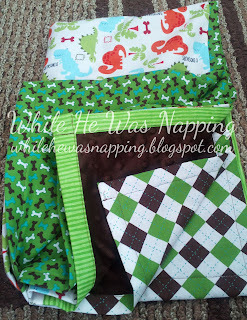 I used four different cotton blend fabrics. 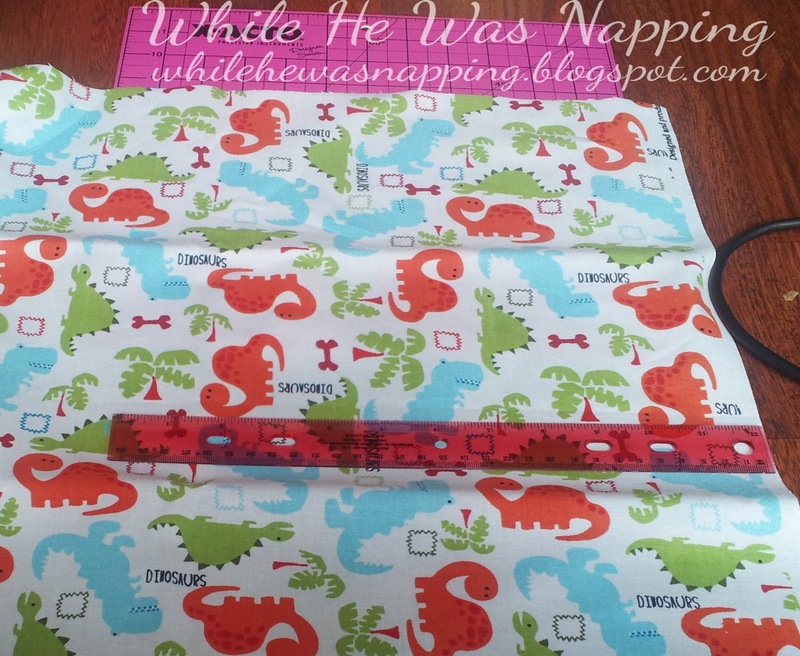 I cut mine to 12″ wide, but you can make them wider or skinnier if you want. – Backing fabric. How much will depend on how big you make your blanket. 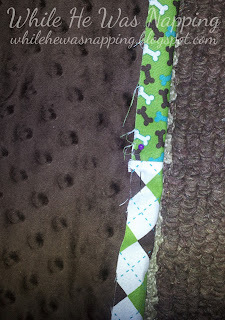 I chose a minky brown and used a little less than a yard. 1. Wash your fabric to prevent shrinkage after you sew your blanket together. 2. Measure and cut each fabric to your desired width. My strips are 12 inches wide. 3. 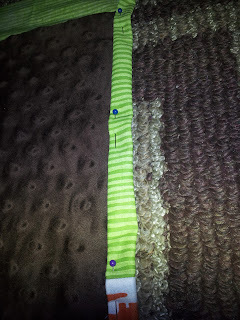 Pin the long sides of the fabric right sides together and sew a straight stitch so you get one long rectangular piece. Iron down your seams. 4. 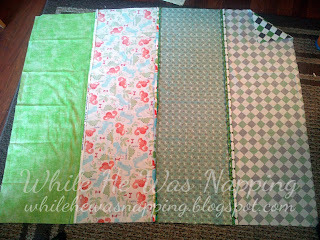 Lay the strips of fabric piece face down on the floor. Position your backing fabric on top. Wrong sides should be touching. The backing fabric will need to be smaller than your strips of fabric piece. You may have to cut it down. 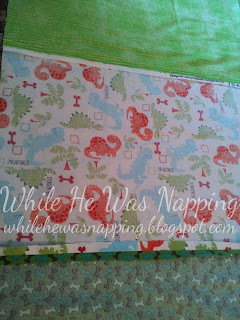 My minky backing piece was a remnant and I ended up having just enough. 5. 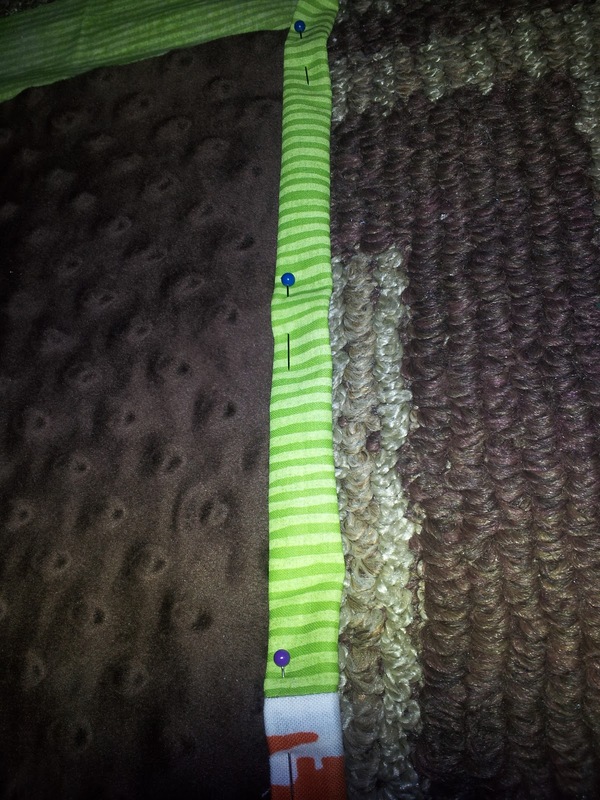 Do a double roll on your hem with your strip fabric. 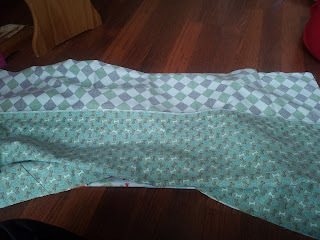 Catch the backing fabric in your second roll so it will be inside the hem. The first roll should have the edges of the two fabrics touching. The second roll should roll down over the top of the backing fabric. Pin your rolls down. Make sure you pin through all layers of fabric. 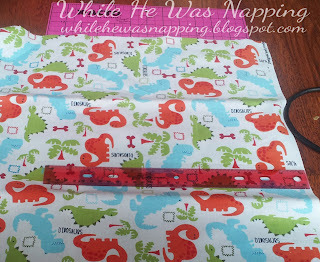 It can help to iron each roll so things will stay in place better as you sew. I didn’t do any kind of quilting on this blanket. I may have to go back and do that. The back of the minky is pretty slick and I may need to do at least a few straight seams to help the blanket keep it’s shape. If I do, I’ll update this. You may want to go ahead and do that so you don’t have to re-visit this project again… Just a though. So cute! I wish that I could sew and quilt. I bought a sewing machine on black Friday and have only used it twice. It’s so hard!! PS: I’m having a give-away right now and I’d love for you to enter!